Disclosure: I received a free copy of this book for this review. I did not receive any payment and was not required to write a positive review. I’ve always been a fan of Brit Stops, a scheme that’s unique in the UK, and gives you the chance to stay overnight at hundreds of pubs, farms and other mostly rural venues, free of charge (except for the modest £27.50 cost of a year’s membership). The hope is that you’ll sample some of the produce or services that each host has to offer, but there’s no obligation, and in my experience, no hard sell, either. It’s a great, relaxing way to tour the UK, especially for foodies and anyone who prefers to stay away from the bustle of busy campsites. Some Brit Stops offer limited motorhome services, such as fresh water or electric hookup, but these aren’t guaranteed and aren’t really the point of the scheme — the goal is that you’ll get a unique taste of different parts of the UK, plus a random combination of great views, food, drink or something else! That said, the Brit Stops guide includes comprehensive details of the facilties available at each stop, plus directions, post codes for sat navs, and important information about accessibility and any size restrictions. 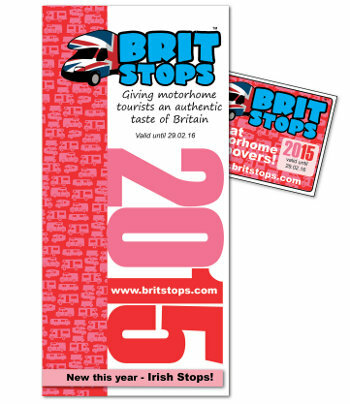 The Brit Stops scheme has also expanded this year to include a number of Irish Stops. In fact, Brit Stops has expanded at a rate of knots since its launch in 2009, and this year’s guide includes 180 new stopovers, taking the total number to 525. I can’t give away too many location details, but I’ll end this article with a personal recommendation. Brit Stop 540 is a Derbyshire farm, situated on the edge of the Peak District, and is really worth a visit. The farm cafe is cosy and comfortable and does excellent, tasty food — and if you don’t want to stay the night, this is an ideal lunch stop that’s not too far from a main road. In fact, so good is the food (and friendly service) that while we were there having lunch, a steady stream of regulars came in to eat, and a couple even booked tables for lunch on the following Sunday. Seriously good food, and the farm shop next door has loads of proper home-baked cakes, pies and puddings, in addition to the usual fresh veg. A must visit if you’re in the area. For an idea of the types of location that are available, take a look at the Brit Stops Flickr page, here. The Brit Stops annual guide is valid each year from 1 March to 28 February. Purchasing the guide gives you one year’s membership and includes a windscreen sticker for use in your motorhome. The annual price of Brit Stops is £27.50 — for more information, or to buy, visit www.britstops.com. Perhaps Britstop publishers could persuade the wonderful Ludlow Food Hall complex ( just outside of Ludlow actually) to provide a ‘Britstop’ – fantastic foods, cafe and garden centre and seemed to have plenty of space around the back. Also, there is The Clive Hotel next door.